Title: The Super Saber, acrylic on canvas, 16X19.5. Painting has much finer detail when viewed in person. 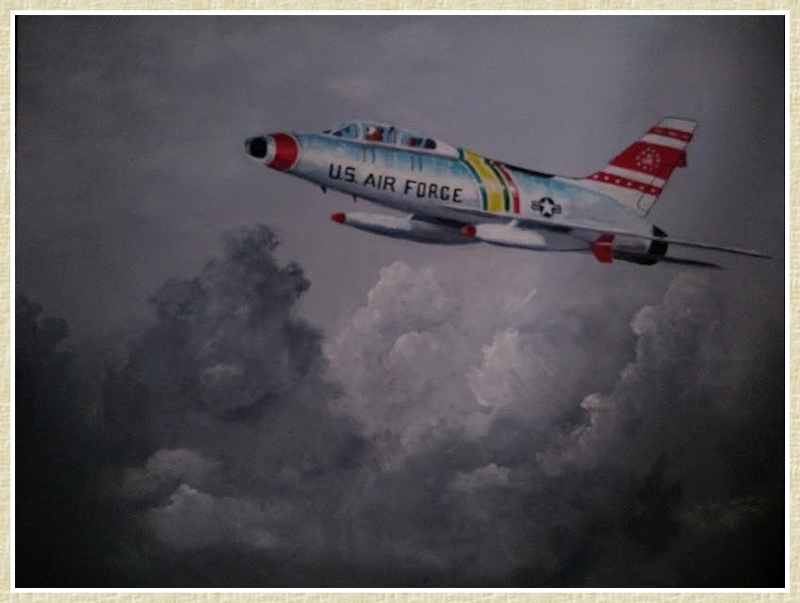 I wanted to depict this old Super Saber jet in it’s air national guard colors, flying over a large storm. In this turbulent setting I hoped to make the best use of my composition’s parts. That being, striking a balance with the plane in the foreground and the heavy dark shades of grey and white in the storm in the background. When you look at it for a minute, does it feel like there is symmetry, that everything is connected? The other key elements that I wanted to meld together are: A definable focal point (yellow stripe), a feeling of motion (angle of plane v turbulence), accurate perspective with shadows and a background light source to highlight the aircraft. So what do you think, did I make it or not? All comments welcome…I’m still learning! Thanks for looking. Check this out, video of model Super Saber, it looks so real. This entry was posted in Art and tagged clouds, F100, Jack Lee Art, Painting, Super Saber. Bookmark the permalink. You have created another nice piece of art work. I think the clouds hold a surprise you may not have intended, but it is interesting. Considering the extra work you have done in the Chico area for the Paradise displaced, I am sure this was a great stress reliever. The video of the remote control jet is really fascinating as well, I am not sure if I had that much time in building such a model I could chance flying it. Harold, thanks for the kind words, but I haven’t done much of anything lately for Paradise folks unless giving them a museum counts? lol As for those models, considering the hundreds of hours of work they put in and all that money, I sure wouldn’t want to be in control of one! Least not until I had lots of practice on something small and cheap! Have you seen the models of 747′, 757’s, etc., with real jet engines? Amazing. They look like the real deal and they’re huge, 7-8 ft. wingspans… incredible. We don’t see a lot of that here in the USA, mostly the big expensive ones are in UK, France and Germany.